You know how I keep that iPhone list of recipes I want to create? Well, “Ranch Mac & Cheese” has been on there for a looooong time. 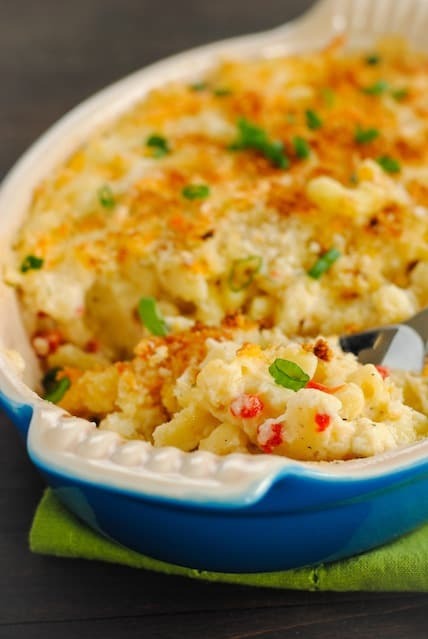 Yes, creamy macaroni and cheese combined with the craveable flavor of ranch dressing. It’s happening. Today. You see, ever since I started using packets of Hidden Valley ranch mix to jazz up Veggie Pizza Wonton Cups, I’ve been hooked on the flavor. I pretty much want to sprinkle it in everything (which my husband, the ranch fanatic, has no problem with). 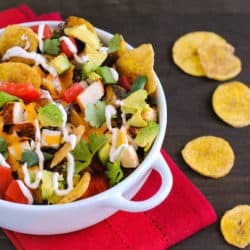 I love it because it adds a ton of tangy ranch goodness without adding lots of fat and calories. You know, if you were making a healthy dish. 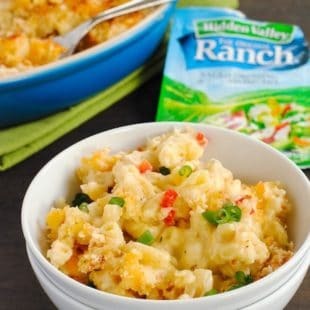 Maybe when you’re already making macaroni and cheese, you forget about the fat and calorie bit, and just focus on flavor. Let’s do that. Everything in moderation, folks. I started with my go-to mac and cheese recipe. 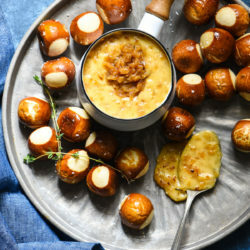 It’s creamy and decadent, with a rich béchamel sauce, extra sharp Cheddar and Monterey Jack cheeses, and a pinch of cayenne for spice. I had a long-neglected jar of pimentos in my fridge, so those went in, too. And, for yet another layer of flavor, a packet of Hidden Valley Original Ranch Salad Dressing & Seasoning Mix. I topped it with some crunchy panko breadcrumbs, baked it until it was bubbly, and then sprinkled on some sliced green onions for a little extra flavor. 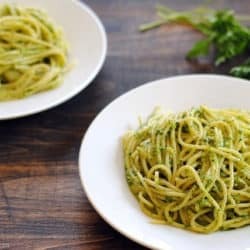 In terms of iPhone recipe ideas-transformed-to-real life dishes, this is right up there on my list of favorites. 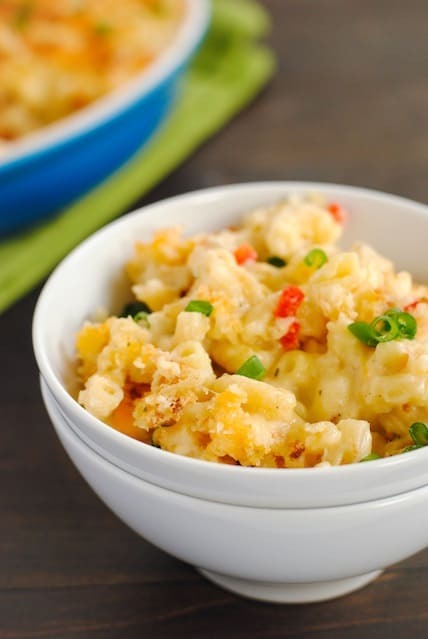 It’s everything I love about my trusty macaroni and cheese recipe, made even more amazing by Hidden Valley. As soon as I finished eating it, I already started jotting down iPhone notes of ways to re-invent it yet again. 1.) Bacon. 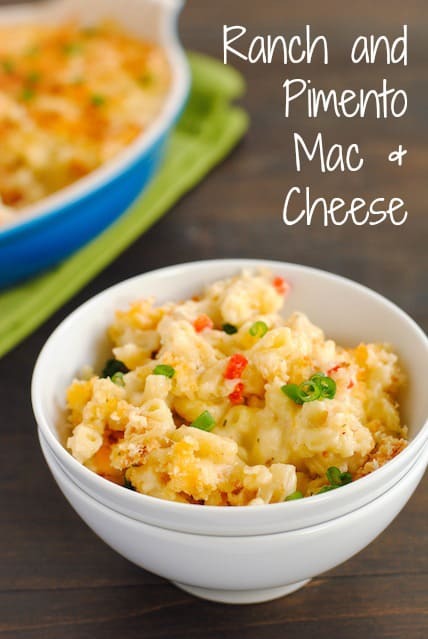 Because Bacon Ranch Mac & Cheese sounds too good to be true, right? 2.) Roasted Veggies. 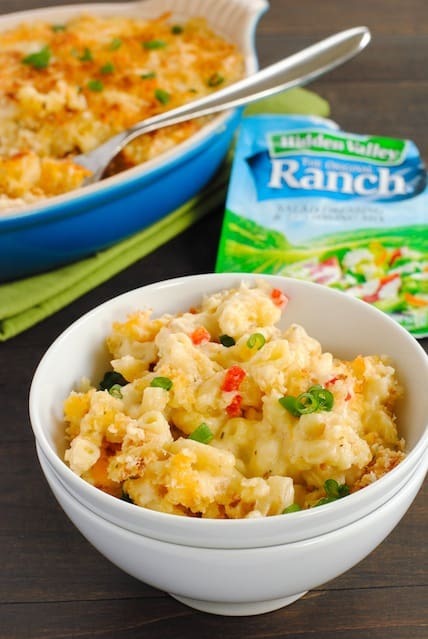 Because ranch mac & cheese is the definition of a crowd/kid pleaser, so why not sneak in some vegetables? Whatever version you decide to go with, please enjoy! Preheat oven to 375 degrees F. Spray 2-quart baking dish with cooking spray. In small bowl, stir together breadcrumbs and 1/4 cup of each cheese; set aside. In large pot of boiling salted water, cook macaroni 9 minutes or until al dente; drain and return to pot. Meanwhile, in medium saucepan, melt butter over medium heat. Add flour and cook 4 minutes, stirring constantly with wooden spoon (do not let mixture start to brown). While whisking, slowly pour in milk in a steady stream. Cook 5 to 6 minutes or until thickened, whisking constantly. Remove milk mixture from heat; whisk in ranch mix, black pepper and cayenne pepper. Add pimentos and remaining cheese; stir until cheese is melted and everything is combined. Pour cheese sauce over macaroni; stir until well combined. Transfer mixture to prepared baking dish; sprinkle with breadcrumb mixture. Bake 20 to 22 minutes or until golden brown and bubbly. Let stand 5 minutes; serve sprinkled with green onions.